In Wetopia we take action to build our community together. Civilians, activists, artists, scientists, entrepreneurs, civil servants and policy makers . When people have little faith in politics it is necessary that we try to reshape our society together. Meanwhile people are already constructing Wetopia. Therefore Curieus and Joke Quintens invite Citymakers to the Festival of Equality – Ghent, december 16th 2017 – to immerse us in Wetopia, where we make city together. All about the Festival here! Civil movements storm the world. As big and less big storms, they bug into traditional decision-making processes. Annoyingly according to some. Liberating, according to others. Some even see a surrogate for our demolished democracy or attempt to embrace them as a new political movement. But “the” civil movement does not exist. It is about always changing, larger and smaller groups of people who try to shift a stone into the flow of our society around different, sometimes temporary themes and for a variety of reasons. Sometimes they want to stop something, sometimes they want to build something, sometimes they want to protest something, but usually they just want to do something. It’s citizens who put their hands out of their sleeves. The challenge: “bottom up meets top down”. Spontaneous participation by citymakers or organized participation in which policy makers appeal to the population. It does not matter. How do we use the talent, knowledge, creativity and commitment of the population to become a better neighborhood, a better city, a better society or a better organization? That’s what it’s about. Not only because we are looking for more support, but because we truly believe that collaborating people are able to offer and implement better solutions. For this it is iimportant that bottom-up initiatives from collaborating citizens are supported by “the top down”, by policy makers. Or concrete: how can policy makers and citymakers meet and strengthen each other in order to achieve a better society? Or as Prof. Filip De Rynck says, “When confidence in the political system approaches the freezing point, the role of the citizen as a producer of policies and services is increasing.” Transition expert Jan Rotmans believes that a sustainable transition can only succeed if all these small initiatives are reinforced by the initiatives and guidance from policy makers. According to Filip De Rynck, this must happen in a kind of space where active citizens can share and improve their initiatives with the help of experts, policymakers and others. And if that does not work, citizens often take control and realize their own projects with others, with inspired entrepreneurs, artists … Also, that’s making city together: we do it ourselves. 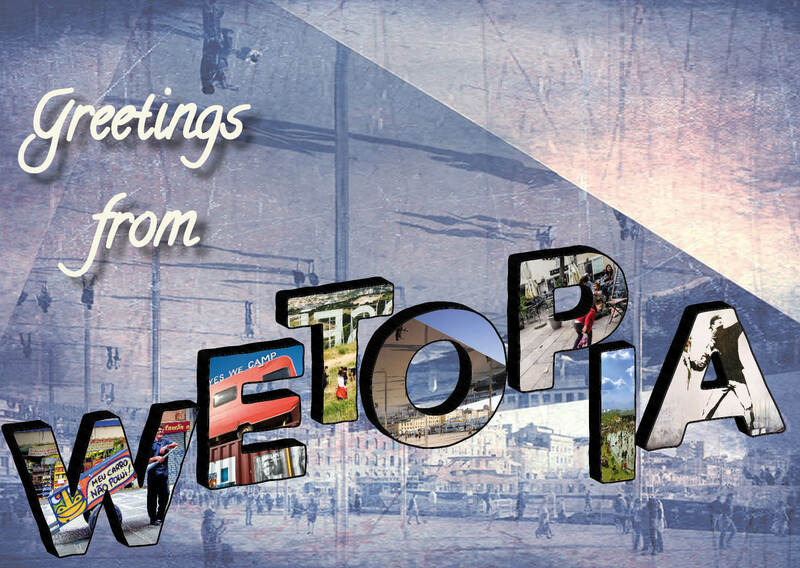 Wetopia – Making City Together. Joke Quintens is an active citizen and entrepreneur who, as facilitator and inspirator, organizes participation and co-creation projects. In 2013, she became in Genk, the third industrial city of Flanders, and many times hit by social catastrophes and challenges, alderman of participation. She introduced a participatory policy whereby the city spontaneously provided the basis for moving forward together and deploying talent, creativity, the experience of the population for their city. Because everybody is creative. Joke works now in and from Marseille, an even more divers, challenging and resilient city. Everywhere in Europe and in the world, citizens, entrepreneurs, activists and artists get started and prospective policy makers offer them a hand to make their city together. In “Wetopia” Joke uses her experiences as an active citizen, entrepreneur, designer of participation projects, but also as a policy maker. Because it is at this intersection, where the bottom-up meets top-down and vice versa, that can thrive a successful participation policy. Indeed, by making “together” city citizens, policy makers, city makers, artists and entrepreneurs, can change “together”.